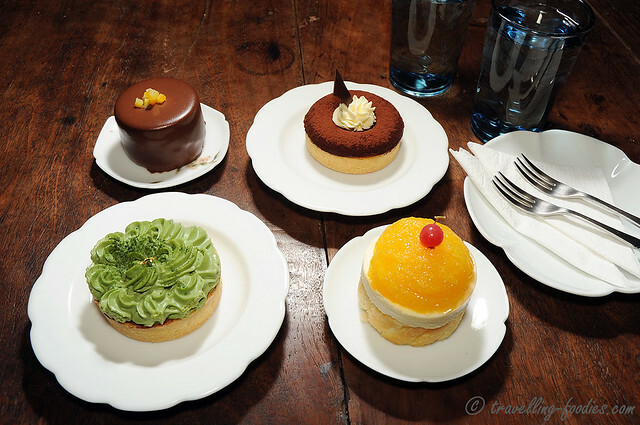 Whenever we travel, we are always on the look out for new pastry joints to visit and try. Well, they may not be new establishments… but new to us at least. And over the last two years, it seems to have become progressively difficult fill up our travelling itineraries and it is not because pastry shops are in lacking. In fact, new places are sprouting at quite an alarming rate in Hong Kong, Taipei and even back home in Singapore, so much so that it is literally a case of being spoilt for choices. Nonetheless, it is always good to visit new eating places which we’d not tried before, especially those which had already been “tried and tested” and hopefully raved by others. With so many places to go and so little time, one can’t help but to be selective. L’Atelier 貝氏邏輯法式烘焙 is a name which I’d chanced upon several times when I visited blogs from fellow Taiwanese foodies. And it stands out amongst the other new joints which have opened and anchored in Taipei over the last 2 years. Their creations are often dubbed as being “simple”, “rustic” and “down to earth”, hardly terms one would associate with the art of pastry making where everything made in all pomp and circumstance seems to be a “norm” in the industry. The ambience and decor of the shop is also much talked about, being “unconventional” and total “unpastry shop” like… whatever that meant. So that naturally got us very curious and we knew we had to try it out. Tucked in one of the small alleys in a residential plot very near to the 台湾國立大學 National University of Taiwan along 新生南路 Xinsheng South Road and 罗斯福路三段 Roosevelt Road Section 3, it is hardly the place where one would find a pastry joint. Surely somewhere more strategic like 永康街 or some kind of 文創区 would have been better we thought? But I’m sure the owners have their own motivations to set up shop here. One thing, they are very near to 台大 and 台湾國立師范大學 National Taiwan Normal University is not too far away as well. Great place for undergrads to spend an afternoon out of class perhaps? Tucked in a residential estate with no prominent signboards or labelling, they are not the easiest to locate. Thankfully we are familiar with the area, having visited the stretch of shops facing 台大 on several occasions, because there are several sports apparel outlet stores there where we would go hunt for off-season shoes, and there is 臺一牛奶大王 there as well, a pitstop for Taiwanese styled desserts, or whenever we have a craving for shaved ice topped with fresh mango. The facade of the shop is just like an apartment in Taiwan in fact. The interior is also quite unique to say the least. 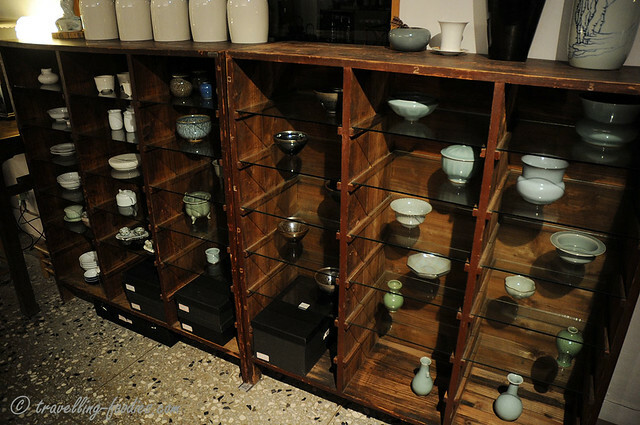 Upon entering, we were not greeted by bright gleaming lights and posh furniture setting, but instead, wooden shelving with a collection of porcelain pieces on display. 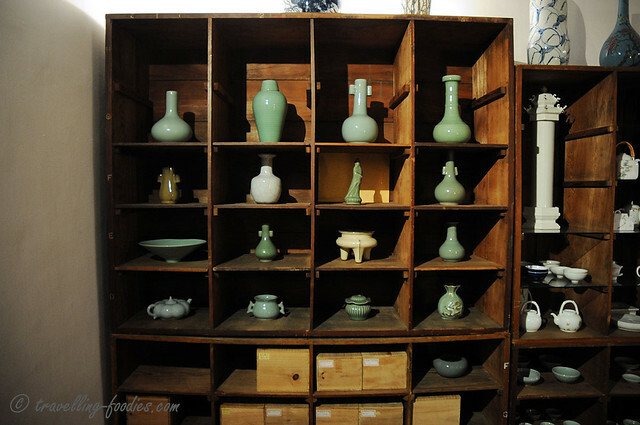 Hence the “rustic” feel I guess, or what would have been more apt as being 古色古香. No lavish sofa seats set in baroque or rococo style but instead, very simple and rather minimalistic Chinese wooden furniture which perpetuates the theme and tone of the whole place. If not for the chiller display which contained a few pastry pieces, we would have thought we are in a place dealing with Chinese antiquities or something. What a paradigm shift it was. We’d ordered 4 pieces to share from the rather limited range of pieces available. It was a rainy weekday evening, almost near their closing time. So I don’t blame them at all. We started with a piece which would have been the lightest on our palate, Charlotte au ‘l’orange 鲜橙夏洛特. 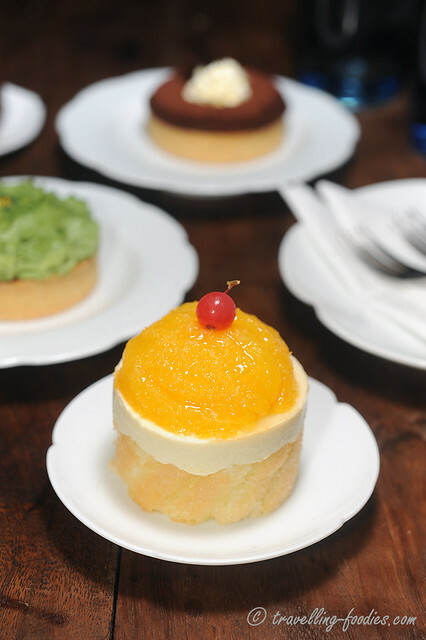 Very simple in composition, comprising of finger sponge filled with orange-infused cream topped with wedges of orange. Using fresh fruit which are locally produced, this piece provided a refreshing start to our sampling, almost making us forget about the rainy and grey weather outside. The finger sponge was delicate and sprinkled with granulated sugar for textural contrast. I welcome any piece which uses fresh fruit effectively and the orange pieces on top did basically just that. 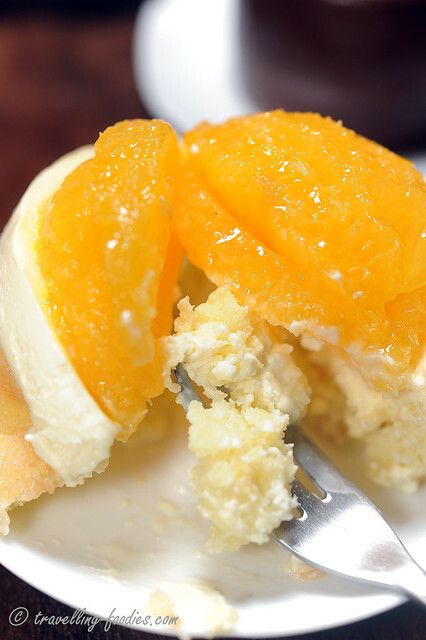 A possible letdown is the creamcheese filling, which was infused with orange blossom water but yet not sufficiently aromatic, which would otherwise make the piece an almost perfect one. So yeah, not quite there yet. Matcha-Chocolate Tart 抹茶巧克力塔. This was the 4th matcha themed piece we had during this particular trip to Taipei. Before that, there was “Duomo Matcha” from Patisserie Sadaharu Aoki and “恋恋京都“ from Boite de Bijou. It seems that many local patisseries have adopted a more nihon-franco approach to their creations and this is hardly a surprise. The Taiwanese have been known to look upon the Japanese in many ways, from business concept, to methodology, to execution and even ideas. 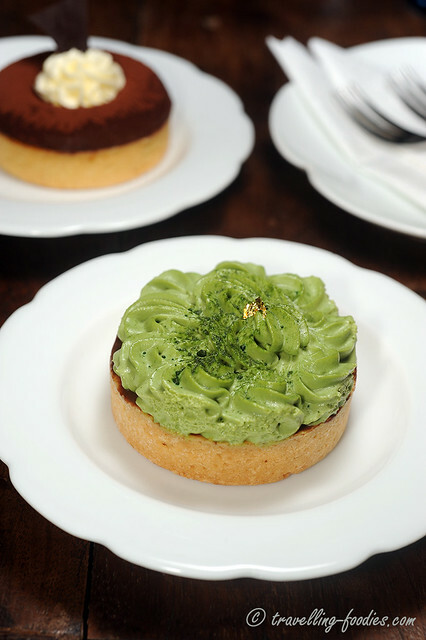 Unlike the two other matcha pieces described above, 貝氏邏輯’s matcha-chocolate tart is surprisingly on the light side. The matcha was only faintly hinted, mainly through the piped matcha buttercream topping and a dash of powdered green tea on top. Otherwise, the main role is actually played by the creme au chocolat an noir within, which was incredibly luscious. The pate sucree base was very crisp and well-baked through. 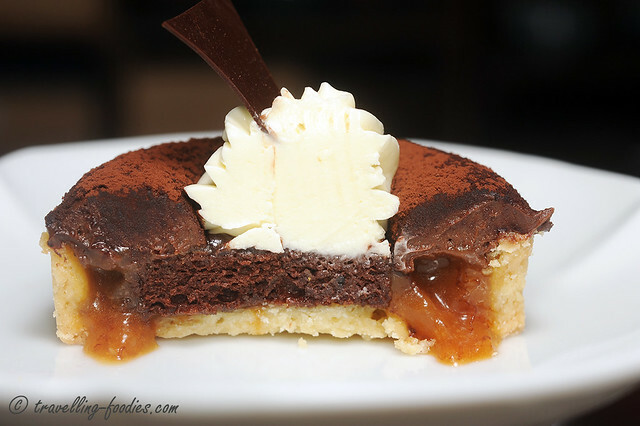 维特烦恼 Die Leiden des jungen Werther– Chocolate-Banana Tart. The third piece we sampled at 貝氏邏輯 and we liked it almost immediately! Like the base for the matcha-chocolate tart, this pate sucree was very well-made. 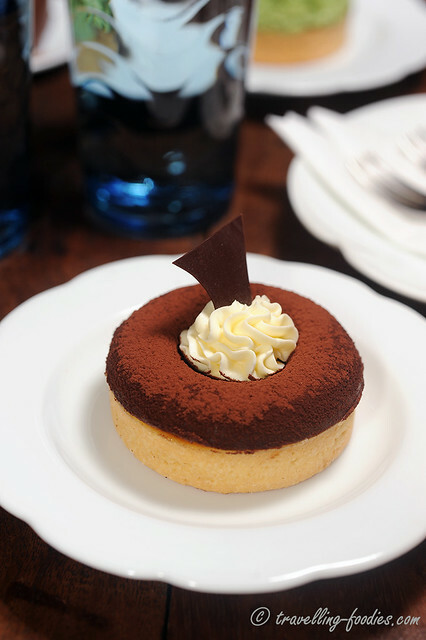 The savarin-like ring dome is made of dark chocolate ganache which was so thick it has an almost truffle-like consistency, rendering a very luxurious touch. It is dusted with cocoa powder with a dollop of Creme Chantilly piped in the centre, embellished with a piece of chocolate decor. 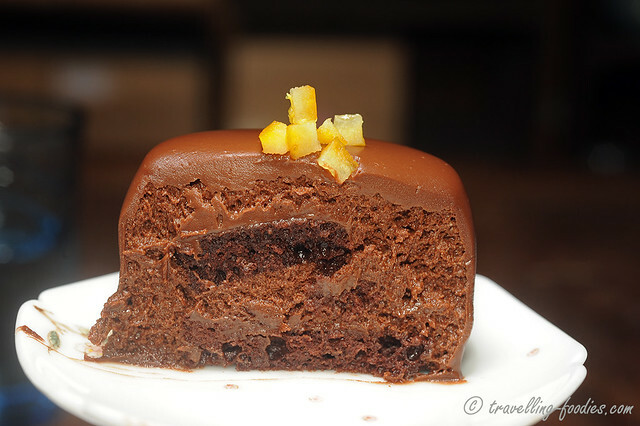 A piece of chocolate sponge cake sits in the base in a pool of caramelised and pureed bananas. The cooking process accentuates the bananas both in flavour and aroma and I’m sure many of us already know that. But the visuals of the banana sauce oozing out as one slices through the tart makes it all the more astounding. Velvety Desires 慾望絲絨 … I wish I could translate this effectively but that is the best I could conjure. And incredibly velvety and lush it most certainly was. Do not be deceived by its simple looks. 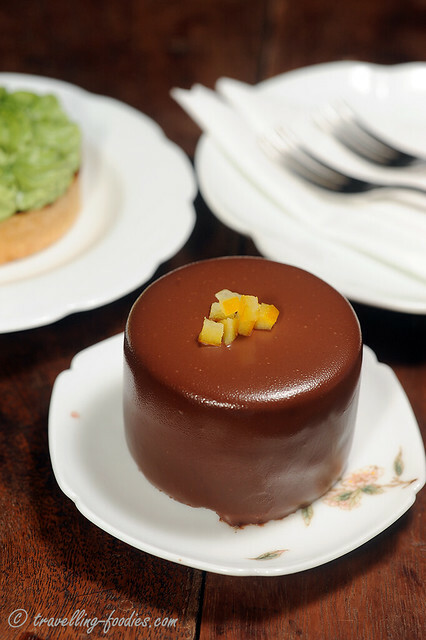 Robed with a thick layer of chocolate ganache and some bits of orange confit on top, it speaks of what is to be expected within without revealing too much details. 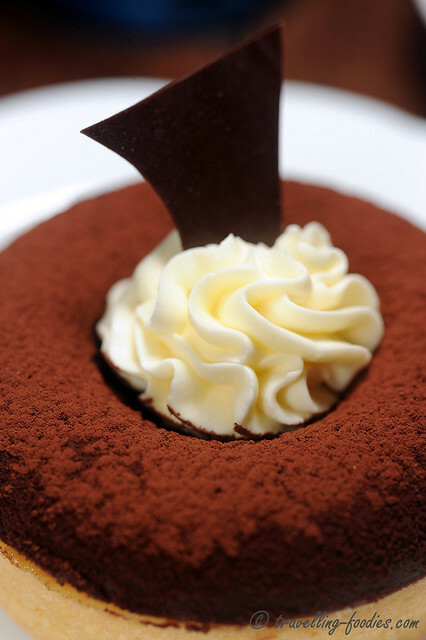 This chocolate mousse base petite gateau is expected to blow your mind away. It much certainly did to us! I was first overwhelmed by the richness and depth of the chocolate mousse, which was followed in quick successions by the fruity notes of orange, which became more apparent in the form of a liqueur, probably Cointreau. The palate experience was quite sensational and could be aptly described as the chinese culinary concept of “回甘”. This entry was posted on July 3, 2013 by Alan (travellingfoodies). It was filed under Food, Travel and was tagged with 维特烦恼, 鲜橙夏洛特, L'Atelier 貝氏邏輯法式烘焙, Velvety Desires, 慾望絲絨, 抹茶巧克力塔.